All about Woolwich, SE18, the neighbourhood and, sometimes, lands far far away. Plumstead Pantry: From Pop-Up To Permanent? Yes, Please! The menu board, with sweet treats in the foreground. By their nature, pop-ups are supposed to be temporary. Discovered by hipsters today, written about in Time Out tomorrow, gone next month. Plumstead Pantry started life as a pop-up a few months ago, but if everything goes to plan, one of SE18’s newest and brightest stars will soon become a permanent fixture in what is becoming a jolly decent local dining scene. When I first heard that a brunch spot had “popped up,” as it were, in Tony’s Café in Plumstead, I had to know more. A pop-up? In Plumstead? A place surely where, much like hurricanes in Hartford, Hereford and Hampshire, pop-ups hardly ever happen. Even Twitter was a bit confused. Some didn’t know what or where Plumstead was. Others couldn’t picture Tony’s Café until locals pointed out its proximity to The Old Mill pub. I was intrigued by a posse of well-trained baristas and foodies invading a traditional Southeast London greasy spoon, but I couldn’t see how they were going to make it work. That said, it only took a couple of photos of drool-worthy plates of eggs benedict, tweeted by indefatigable SE18 enthusiasts @saminus and @SteveToole, to convince me to traverse the lower slopes of Shooters Hill one sunny Saturday and strike out in the direction of Plumstead Common. We’d woken up at the crack of 11am, busting as ever for bacon and coffee. 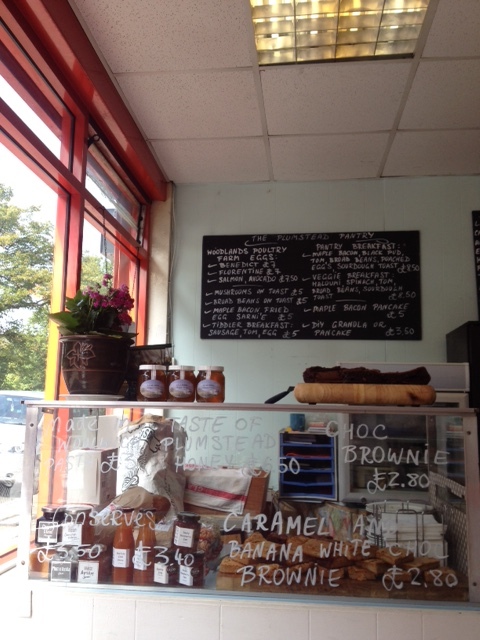 Happily, we soon found out that Plumstead Pantry does both of those things extremely well. Owners Julia and Ashley source the bacon (and everything else) locally. Chef Ashley then performs some kind of alchemy in the kitchen to turn the succulent rashers into even more succulent Maple Bacon. I don’t normally go in for random capitalisations, but the Maple Bacon deserves it. Our first crack at the menu was the Pantry Breakfast, the flagship offering. It features eggs on top of sourdough toast (bread baked that day by Charlton-based artisanal micro-bakery The Honest Loaf), a lip-smacking pile of Maple Bacon, a slice or two of black pudding, grilled tomatoes and broad beans. My friend Kim would not condone the broad beans because they go against her no-greens-for-breakfast mantra, but I think they complement the meatier aspects of the dish very nicely. If meat isn’t your caper, there’s the Veggie Breakfast of haloumi, mushrooms, poached eggs, sourdough toast, tomatoes and beans. No Maple Bacon, though, so I’ll probably never order it. If cutlery and grown up things on a plate is too much for your hangover, just go for a bacon/egg or sausage/egg sarnie. They’re large and restorative. And the coffee? Well, someone has to be the winner and I reckon Plumstead Pantry does the best coffee in SE18. At least, that’s my opinion as a Melburnian who has sat on many a fake-grass-covered upturned milk crate in Fitzroy, Brunswick, Abbotsford and central Melbourne’s café-lined laneways, sipping flat whites that come as close to perfection as can be imagined. I know I could spend an hour traveling to some hipster café in Soho, or queuing for 40 minutes outside Monmouth Coffee near Borough Market, but I don’t want to have to. I really don’t. The many flat whites I’ve inhaled at Plumstead Pantry have been consistently very, very good. Bold and bright enough, with a creamy texture and lovely finish. Well played, Plumstead Pantry baristas. Besides ensuring the cranky likes of me get their fill of bacon and coffee, Ashley and Julia have also been working hard to establish the Pantry’s dinner menu. We’ve not been for dinner yet, but the menus that flicker across my Twitter feed sound seasonal, local, healthy, and wonderful. Green tea salmon with jewelled bulgur and harissa yoghurt. Pork tenderloin with greens, brown rice, and Oxleas Wood apples. Tofu burger with kimchi and miso salad. And so on. At the moment at least, you bring your own wine. If everything falls into place, Plumstead Pantry will soon be permanent. An interior refurbishment is on the cards, too. The notion of the Pantry staying on and growing and becoming a beloved landmark will make its already-sizable legion of local fans very happy indeed. As a near-local from the other bit of SE18, I too cannot wait! Details: Plumstead Pantry currently does dinner from Tuesdays through Fridays, and brunch on Saturday and Sunday. Dinner, BYO booze. The address is 16 Warwick Terrace, SE18 1QJ but most people just know it as the café near the pub. Follow on Twitter and Instagram @PlumPantry. Great to see you’re back 🙂 We were getting a bit worried. I’m a Dutchman in Woolwich/Shooters Hill and you made the transition to living here a lot easier for us. Thanks! Leon – could you please contact Subterranean Greenwich & Kent when you have time. Thanks very much 🙂 Or perhaps anyone who knows Leon could ask him to contact SubG. Pass The Popcorn, The Charlton And Woolwich Film Festival Is Here. And It’s Free! A Farmers Market In SE18? Oh Look, There It Is!